A healthier Perch River Wildlife Management Area is 65 acres closer to reality. In December, Ducks Unlimited completed an important phase of the $2.5 million enhancement project, coordinated by the New York State Department of Environmental Conservation (NYSDEC), in Jefferson County to improve habitat for wildlife and hunters. Perch River provides nearly 8,000 acres of critical wetlands and uplands for waterfowl and other wetland-dependent species in the St. Lawrence Valley. 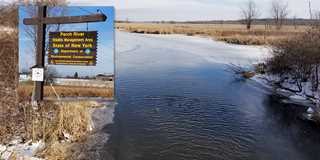 But inadequate infrastructure prevented wetland managers from maintaining proper water levels. That resulted in dense stands of cattails, significantly reducing the value of the habitat for wildlife. Ducks Unlimited partnered with the NYSDEC to improve water channels and water flow, improving 65 acres of wetland habitat. The Ducks Unlimited phase complements the rehabilitation of failed water-control structures that are being restored by NYSDEC. The cooperative effort will give wetland managers the tools they need. Ducks Unlimited in December completed one phase of the overall project designed to maximize water flowing through the management area. Crews constructed potholes and widened and deepened existing water channels. The NYSDEC is nearly complete with replacing water-control structures to better manage the new system. Ducks Unlimited developed a water level management plan and helped with design concepts for the structure. The $2.5 million project benefits mallard, American black duck, northern pintail, greater scaup and several state-listed threatened, endangered and special concern species, such as black terns. Perch River WMA is a state-owned public recreation area, and portions are used extensively for hunting, fishing, trapping, bird watching and non-motorized recreational boating. Funding is provided through a NAWCA grant, the Pittman and Robertson Act, Ducks Unlimited and Cargill.